Lauren A. M. Lebois, PhD, is a cognitive neuroscientist focusing on the biomarkers of trauma-spectrum disorders as an Assistant Neuroscientist in the laboratory of Kerry J. Ressler, M.D., Ph.D. She is also the Director of Neuroimaging for the Dissociative Disorders and Trauma Research Program led by Milissa L. Kaufman, MD, PhD. Overall, her work aims to scientifically examine the predictors and correlates of posttraumatic neuropsychiatric sequelae, and in doing so reduced stigma and improve psychiatric care. 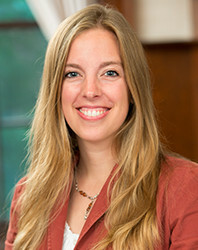 Currently, she employs functional magnetic resonance imaging, neuroimaging genetic, and behavioral techniques to better understand the mechanisms of traumatic dissociation, Posttraumatic Stress Disorder (PTSD) dysfunction and recovery. She has a particular interest in self-processing related to PTSD and Dissociative Identity Disorder. Dr. Lebois has a background in human neuroimaging and behavioral research, as well as both undergraduate and graduate level teaching experience. She completed her doctoral training at Emory University with Lawrence Barsalou, PhD. Her previous work examined the role of context and learning in emotional experience, and the cognitive and neural mechanisms of stress and mindfulness. Importantly, this work suggests that part of why mindfulness may have a therapeutic effect is by allowing one to disengage from self-processing. ​Lauren is passionate about all things Irish. In her spare time, she enjoys fiddling and running.